, an English gentleman, clerk of the house of commons in the reign of Charles I. was born at Battersea in Surrey, in 1598; being the eldest son of Henry Elsynge, esq. who was clerk of the house of lords, and a person of great abilities. He was educated at Westminster school; and thence, in 1621, removed to Christ Church, in Oxford, where he took the degree of B. A. 1625. Then he travelled abroad, and spent at several times above seven years in foreign countries; by which he became a very accomplished person, and was greatly esteemed by men of the highestquality and bestjudgment. He was in particular so much valued by archbishop Laud, that his grace procured him the place of clerk of the house of commons, to which he proved of excellent use, as well as a singular ornament. 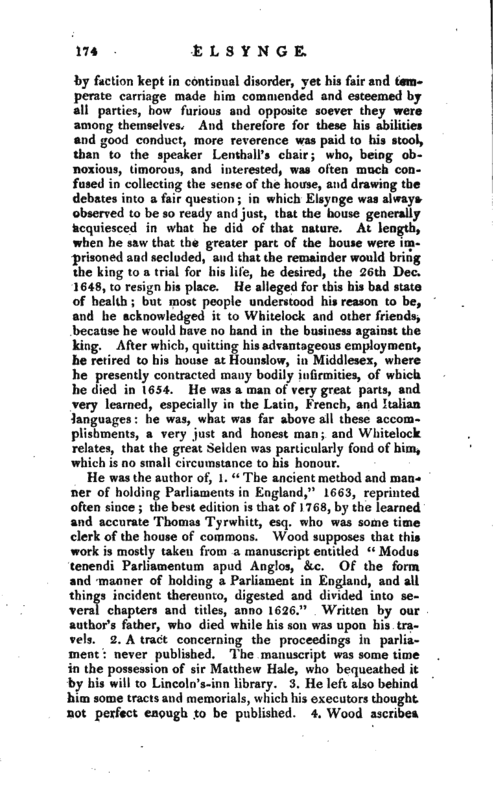 For he was very dextrous in taking and expressing the sense of the house; and also so great a help to the speaker and to the house in stating the questions, and drawing up the orders free from exceptions, that it much conduced to the dispatch of business, and the service of the parliament. His discretion also and prudence were such, that though the long parliament was | by faction kept in continual disorder, yet his fair and temperate carriage made him commended and esteemed by all parties, how furious and opposite soever they were among themselves. 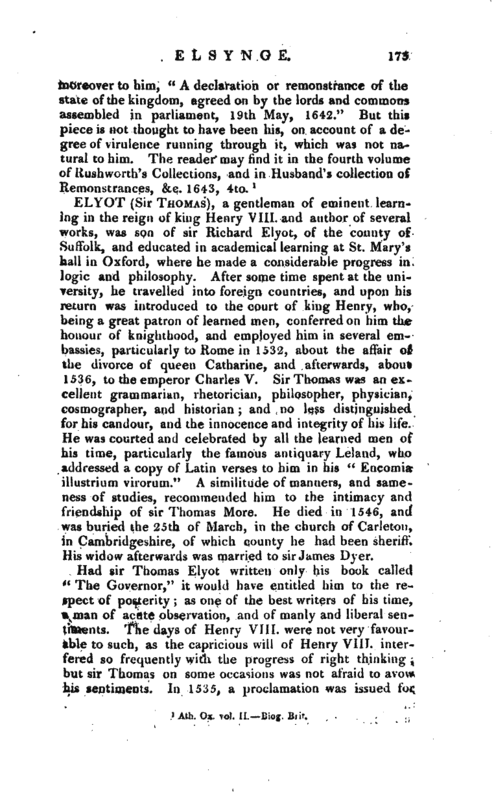 And therefore for these his abilities and good conduct) more reverence was paid to his stool, than to the speaker Lenthall’s chair; who, being obtioxious, timorous, and interested, was often much confused in collecting the sense of the house, and drawing the debates into a fair question; in which Elsynge was always observed to be so ready and just, that the house generally acquiesced in what he did of that nature. At length, when he saw that the greater part of the house were imprisoned and secluded, and that the remainder would bring the king to a trial for his life, he desired, the 26th Dec. 1648, to resign his place. He alleged for this his bad state of health; but most people understood his reason to be, and he acknowledged it to Wbitelock and other friends, because he would have no hand in the business against the king. After which, quitting his advantageous employment, he retired to his house at Hounslow, in Middlesex, where he presently contracted many bodily infirmities, of which he died in 1654. 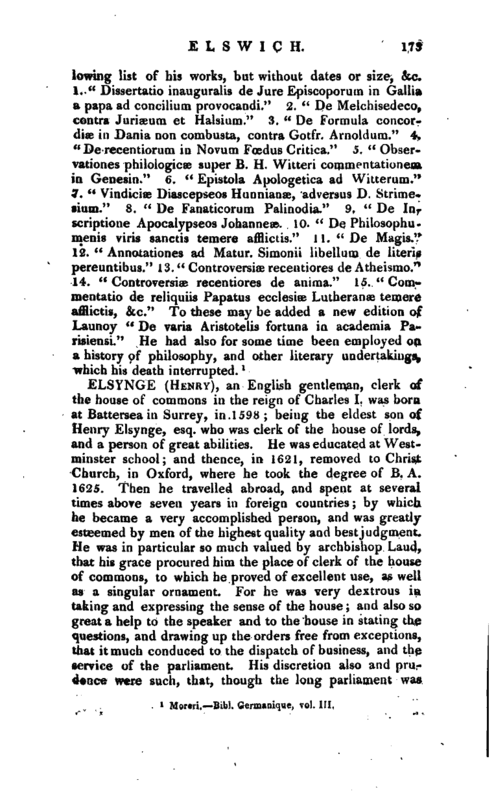 He was a man of very great parts, and very learned, especially in the Latin, French, and Italian languages he was, what was far above all these accomplishments, a very just and honest man and Whitelock relates, that the great Selden was particularly fond of him, which is no small circumstance to his honour. Ath. Ox. vol. II. Biog. Brit.